Hate that nagging feeling that you're forgetting something on your trips? I do too. 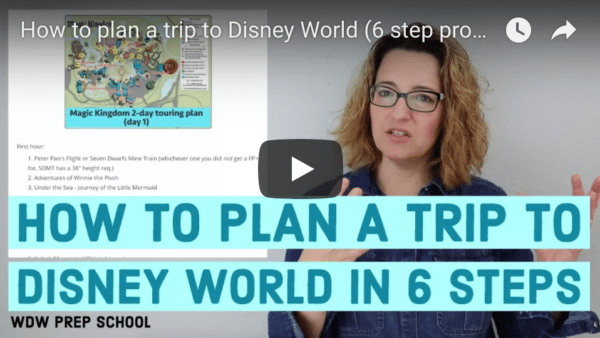 That's why I put together this huge Disney World packing list to help you remember lots of items that you might otherwise forget. 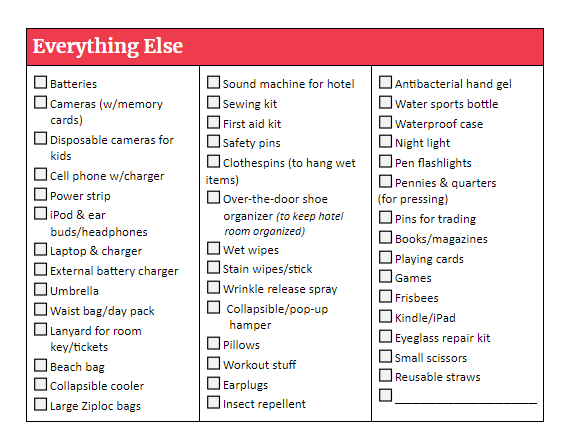 THIS LIST IS NOT INTENDED TO IMPLY YOU SHOULD BRING EVERYTHING ON IT. You shouldn't (though one reader's mother did that once!). This is just an all-inclusive list to help jog your memory. Please pin it, save it, print it. Whatever you like. I hope you find it helpful. Because of the heat, humidity, and frequent rain I oftentimes find myself changing clothes at least once per day (typically whenever I go back to my resort for a break). So, if you are like me and hate wearing damp or sweaty clothes, take that into consideration when packing by either planning to pack plenty of items OR by planning to do some laundry while you are there. Toiletries involve so many things that it can be easy to forget something important. If you do accidentally forget something, all of the Disney resorts have shops where you can buy some emergency supplies or you can also use a grocery delivery service to have something delivered to your resort. Medicine (especially your prescription medication) is one thing you don't want to forget on vacation. Here are some common items you may find in your medicine chest that are useful to travel with. Laundry isn't typically on anybody's list of "favorite things to do while on vacation" but if you find yourself planning to do some on your trip, here's some things you'll probably want to have with you. It may be the digital age but lots of people still like to have their most important travel information in paper form. If you opt to do everything digitally we recommend saving any important confirmations to a spot where you can access it from multiple locations (like by emailing it to yourself or using cloud-based storage). Even if you aren't staying in a room with a full kitchen there are still lots of reasons you may want to have some grocery items with you. Many people have their groceries delivered, but if you are flying on an airline like Southwest where each person can have multiple checked bags for free, it might make sense to bring some snacks with you. Here are some good options for that. If you'll be taking a road trip to Disney World there are some things that can make that journey a little easier. Crossbody purses and backpacks are 2 popular options for park touring bags and since you can take your bag onto nearly every attraction at Walt Disney World, it makes sense to carry at least a few items with you when you go into the parks. Here are some things you might find useful when touring Disney World. 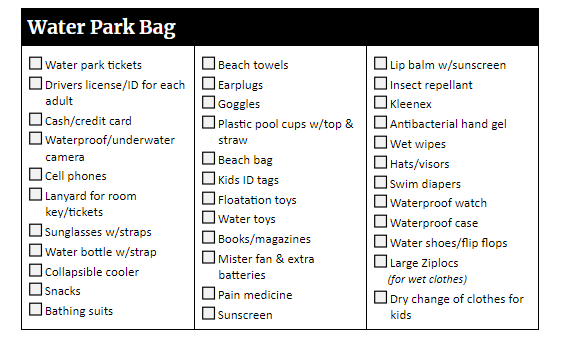 If a visit to Blizzard Beach or Typhoon Lagoon is on your agenda, you'll definitely want to pack the sunscreen (plus probably a few other items in the list below). Traveling with a baby often means that you'll find that your trip goes a bit easier when you have some items from home with you. Take a look at this list for help remembering everything you might need to pack when traveling to Disney World with a little one. Prefer your packing list in digital form? You can find all the items from the print form on the WDW Prep Packing List app. These handy little items can make staying organized so much easier (I recommend purchasing a different color for each family member). They help keep your suitcase organized, plus they can help protect your clothes if you like to use the drawers in hotel rooms. This is one of my favorite packing tips that not only helps you stay organized but also helps speed up your mornings. Pack each outfit (down to underwear and hair bows, etc.) in a Ziplock bag so that when it comes time to get dressed in the morning, you have everything for that day ready to go! If you spend 5 minutes in an airport you'll realize that most bags look alike. Make yours stand out by adding something to it that is unique, like ribbons or special tags on the handles. Don't wait until the day before to begin packing. 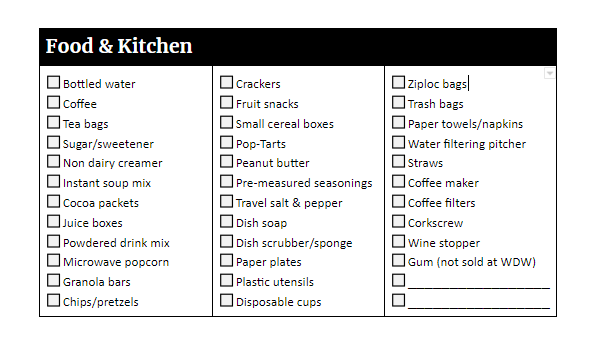 Pick a spot in your house where you can start collecting the items you'll be taking with you. Unless you are planning on shipping stuff home (or buying a bag while you are there) make sure you leave some space to bring new treasures back with you. If you are flying, you'll want to make sure you know your airlines weight limit for bags and then weigh yours before you get to the airport. Luggage scales are an easy way to do that. Although the goal is to get both you and your luggage to the same destination at the same time, sometimes things happen. Because of that, it is better to not pack only 1 person's items per/bag. Instead, spread it out so that if something does go missing you're not trying to replace everything for 1 person. It's also a good idea to take some photos of what you are packing into each bag, that way if something does go missing you'll have an easier time remembering. In the unlikely event that your tag on the outside of your suitcase rips off, make sure you have some sort of identification on the inside of your suitcase, too. Even just simply taping your contact information or a business card to the inside of your suitcase will work. And don't forget your carry on bags - give those tags, too. (For younger kids make sure their names aren't visible on their bags, though). Most of these fold down into basically nothing but they can make a tiny hotel room feel a lot more organized. Plus, if you are planning to do laundry they are super helpful for that! Consider folding your clothes when packing. Not only can rolling help with wrinkles, rolling can make it easier to fit more in your suitcase (just be careful not to go overweight!). 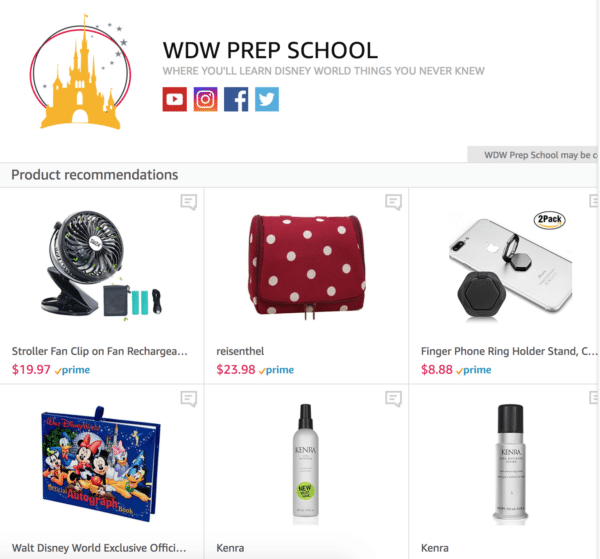 Before you leave, check the WDW Prep Amazon Shop for recommended products to make sure you have everything you need. 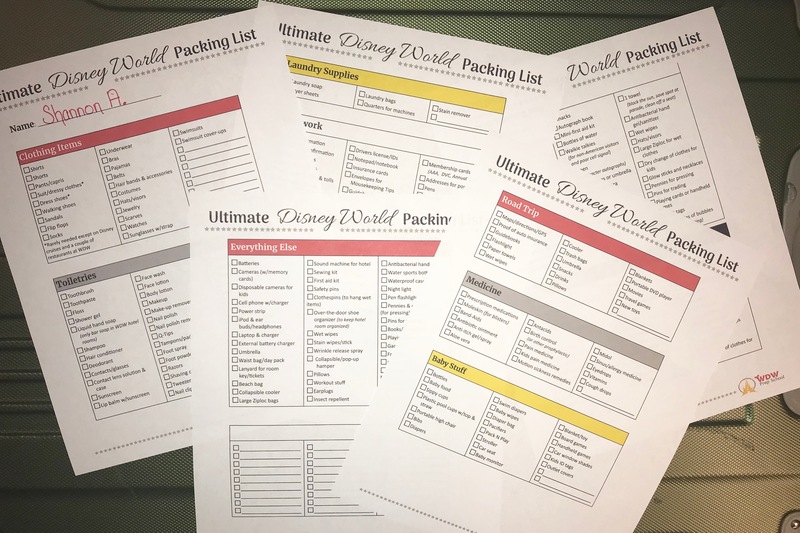 Thoughts or questions on this ginormous Disney World packing list? Tell us about it in the comments. One thing I would add is post it notes. My little is just learning to use the toilet and the auto flush ones scary her to death. I put a post it over the sensor and she knows it wont flush. Gives her a chance to relax and go to the bathroom all the way. I’m heading there in Janurary with just me and my friend as a girls trip. Does anyone have any packing tips for the weather? I’ve never been to Florida in January! PLEASE make the packing app available on Android devices! Just to let you know, that I refer to this list no matter where I’m traveling. It’s so complete that I’ve found it to be so helpful for my non-WDW trips, too. Thank, Shannon! This is definitely way in advance haha but I was wondering how much chance of rain is there in Orlando during December? We’re going about the second week of the month and I’m just wondering what kind of weather we’ll find when we get there. You’ll want to check the forecast before you leave for your trip. Thank you for all of this! We are taking our kids to Disney for the first time and I’ve had so many questions. You have had amazing answers. You have already lessened my anxiety a ton! can you bring a wagon. the fold up ones. I have 3 kids and a wagon will work better than a stroller. but if wagons aren’t allowed we will just bring a stroller. thanks. great list. thanks for the sun block I totally forgot that one. Glad you liked the list! Wagons aren’t allowed in the parks. Best to stick with a stroller. Liquid Benadryl is also great for long flights with young children. We take a red eye every year from Seattle so the kids can just sleep. We got a ton of compliments about our granddaughter’s wonderful behavior! Thank you liquid Benadryl! We just gave it to her in line at the ticketing desk so we could get it into the checked luggage last minute. if your child is not sick i dont recommend giving uneeded meds. a great alternative is melatonin for kids. its natural. we use Luna brand(Amazon) or if Zarbees honey all natural cough syrup night time. Our pediatrician recommended that we use allergy/decongestant for our children when flying to reduce pressure from extra fluid in ears/sinuses. It’s a bonus if it helps them doze off ? We travel this time of year everytime. Days are warm but layer or take a light jacket because nights can get cool! I would recommend making or buying Disney ears out of the park or on etsy. Also buy Disney stuffed animals out of the park and giving them to your kids in the park. They are so expensive and you could get them at 1/2 the price. do anyone know if you need to bring swimming stuff to disneyland paris? Bandana (for wiping sweat off my forehead) – gross, I know. I sweat on command…. Yes, I think 4 is the perfect age for a 1st visit to Disney. That was the age both of my children were the 1st time we took them & they had a great time. They still remember their 1st visit to Disney. Double-up on the undies in the summer! Not just a good idea for little ones who might have an accident, but for everyone to have fresh clothes after the mid-day pool/shower break & maybe to sleep in. My kids thought I was crazy when I told them to pack 10 for a 4 day trip, but we used them all! The M&M tube idea is fabulous! Myself, my husband, and our three year old son are going in about six months. Something I have to add is a pinch of patience. I know that for myself and my two guys we are good when it comes to waiting or the heat, but when mixed with thousands of other, more than likely less prepared tourists, it can be a bit frustrating. Mix it in with your pixie dust and all will have a magical time. I would add a baby wrap/sling and toddler leash to the baby section. I’m bringing both this trip. Thanks, Shannon! If you don’t drink Coke products, bring it with you! I’m a Dr. Pepper person and my hubby finally had to make a convenient store run after the 3rd night. 🙂 This time I’m packing 3-4 can of Dr. Pepper! It mentions dressy clothes in your list… is there a list or place I can see which restaurants at WDW have dress codes? I assumed most didn’t because if they are in the parks doubt people would be walking around and riding rides in their outfits, right? The only real fancy place I can think of is Cinderella’s castle and even then I’ve seen pics with people in shorts and tees. Anywhere inside the parks shorts and tshirts are fine. The Yachtsman steakhouse or Victoria and Alberts are places to dress up. There’s also a restaurant at Animal Kingdom lodge that has a dress code. (Not Boma, but can’t remember it.) I just remember seeing the dress code and thinking I couldn’t go in the last time I was there. I only had shorts packed since it was the middle of the summer. One thing I always forget is a birth certificate for my baby. The airline requires it for all children under 2, riding as a lap child (just to prove that they are indeed under 2). It’s such an important thing that is so easy to forget! You don’t need to bring the actually certificate, a copy is just fine. Thank you for posting this! I would have had no idea that I needed to bring this. Interesting. I’ve flown a dozen times with my under 2 year old. I brought their birth certificate the first time and was told I didn’t need it, so I haven’t brought it back since. Which airline? Southwest is the only one who has asked me. They were horrified when I told them I’ve never been asked before. It’s to protect the child from being taken out of state without the parent’s permission. So it is a little scary more airlines don’t ask. That’s great for your family, but for the family that comes after you, there’s going to be an artificial chemical stench filling the room, and for my family, that can be life-threatening due to anaphylactic airborne allergies. Please be considerate of others and rethink your aroma bomb. Do you know about housekeeping?? Unfortunately, your family should reconsider going to Disney world due to the parks having Disney Air Smellitizers to make areas seem more authentic to not just looks, but smells as well. As a healthcare professional, airborn allergy anaphylaxis is rare, and if your family is that sensitive then you will be at risk in the parks. people can also be allergic to as well. My brother is allergic to everything, even the hair on his head, but my family is still going to live their lives and have a memory scent using oils. One question I cannot find a straight answer to. Can you take the spray cans of sunscreen into the parks or does it have to be the rub on type? At many sporting locations, they do not allow the spray cans. Thanks for the great list !! I know its still not an absolute straight answer but when we visited in May 2014 we forgot our sunscreen and bought a spray from a vendor inside the park and used it for the rest of our trip without issue. I’ve been many many times & I’ve never had any problem taking spray sunscreen into the parks. I could be wrong, but I’ve never had an issue. We go every year and we use the spray cans. I also see other families using them also. Thanks for the list. I’d also add goggles. My kids have to bring them. You’ll spot them under the “water park bag” section which should really be the “swimming stuff” section, I guess. I’d recommend brining swimmers ear drops. My kids get ear infections easy. That can ruin a trip quick. This may be on the list and I might have missed it, but I recommend bringing some body glide. It’s a deodorant like product that runners use to prevent chaffing. We have found it works amazing when doing lots of walking! We bought ours at Dicks, but I bet any athletic/outdoor store would have it! Don’t forget that if you smoke it’s a MUST to bring a carton of cigarettes! Also, if you like your “special brand” of tea or hot cocoa, bring it with you and ask for free HOT water at any of the QS restaurants in the parks. They will give you a large cup FREE if you ask! Lastly, old fashioned FANNY PACKS are great for the parks. Back packs are just too cumbersome when you are trying to ride the attractions. With a fanny pack you can just slide it to the side or in front of you and you’re ready to go! arent the cigarettes in orlando airport cheaper than alot of places? I’m taking a low profile sling style bag I saw on ABC’s shark tank. Marketed towards men, but who really cares! It’s the perfect size and style for disney! Nancy if you ever plan on going to the United Kingdom get in the habit of calling it a BUM bag. Why, don’t ask. Hello WDW Prep!!! Thank you so much for all your information that you share. I was wondering if you had a blog about rented EVC wheelchairs outside of WDW? They are so expensive at Disney….$70.00 but you get $20.00 Back each time. I see all these red EVC all the time. I have lupus and I can’t walk far or stand too long. And we are Disney freaks. We are there every 2 or 3 months. If you google scooter rentals, you will find them at a much better rate than the Disney park rentals. If you’re staying on property, they deliver them to the airport for the ride back to the Disney hotels. HI Melanie, I too suffer from lupus and we are planning on taking our 5 yo grand daughter in October 2015. I was wondering if you could please share with me what company you were able to find I would greatly appreciate it. I just got back from our Disney trip and had to get an ECV for my dad. I used Walker Mobility Orlando and they were GREAT! Fantastic service and on time and answered all questions at a pretty good price compared to renting from Disney. Such an amazing list! Thank you and especially for the Mousekeeping envelopes, they are adorable (just printed them out!). You wouldn’t happen to know where I could find some for Universal Orlando would you? I have a Mac and unfortunately could not download Gimp. Thanks for any help and again for the list, customized it and printed it out! This list is absolutely amazing! My only suggestion is that you will not need insect repellent because Disney World has a bug repellent system that is used throughout the parks. If you’re going to be spending any time at ft wilderness, you might want bug spray! We went horseback riding there and I got bit up! I do agree that you don’t need it if you are going to be just in the parks though ! Hello! Love the list and the extra comments too! I bring a collapsible drying rack (it fits inside my larger suitcase). I take a hotel towel and lay it on the floor (for all the drips!) and set up the rack by the outside/balcony door. It may be a little bit of extra work, but if you are traveling with a larger family, it really helps organize all of the swimsuits, towels, etc. I was too tired at the end of a Disney day to remove all of the swimsuits from the shower area each night for all of our baths, so this worked well for me! I bought collapsible laundry hampers, different colors ($4.00 each maybe @ Wmart). We put dirty towels/clothes in one color hamper, and clean in the other color hamper. We had our big family plus grandparents staying in a house, & clean items might not get folded/put away so quickly. It helped the little ones and the bigger ones, Keep It Straight. Thank you very much! This is so helpful! I appreciate the Word version. For my needs, I added zip strips for luggage and the camera charger. Everything else was covered for me on your list! I brought our collapsible step stool for the hotel bathroom which has high counters. It saves me from lifting the kids each time they wash hands or brush teeth. pack a night light….comes in handy for everyone to find their way around at night. Another tip for kids using the bathroom at night-if your hotel room has the pull across curtain by the sinks, use that as the bathroom door at night…plug night light in by the sinks…this way the toilet can be used and the harsh lights don’t need to be turned on an wake up the rest of the occupants. I also pack a small size lysol spray can…works on everything from smelly sneakers to stinky bathrooms! I started taking epsom salt. It’s great for soaking your feet after a long day of walking, or maybe a long soak in the tub. to pack the pennies to press, we pack a M&M’s mini tube with a stack consisting of 2 quarters and 1 pennie and repeat. Also the markers for autographs we use the large sharpie that are the click type style. That way you don’t have to bother with a cap. We make our own autograph books. use color paper cut in half and decorate with stickers and customize, then we take to the local Kinko’s and have the top and bottom sheet laminated and the whole book bound. For a few bucks you have a custom autograph book. The M&M tube is a fantastic idea! I have used one of those cheap “ID holders” and they’re always a pain. And I never seem to have the right combination of pennies and quarters. I’m taking the kids down in a few days and I’ll have to give the M&M tube a shot! A highlighter for your maps. Or a Red pen to mark out where you have already seen/been, as you go. This list was so helpful–I was going to type my own, but I was able to edit yours for our needs. The only things I would add are: a rubber bath mat to give my toddlers baths in the hotel tub without worrying about slips and falls and an extra Pack N Play sheet. Thanks! Thanks for the list. I added an aluminum carrying case or aluminum foil for my credit cards to help protect them from the latest electronic frauds. You never know…we went last September with kids ages 4,3 and 1. Then Our Disney souvenir baby was born on June 21, 2015. We had so much fun we are headed back this September. Don’t forget a clear shower curtain for the stroller, it is much easier to pack away than a stroller cover for those rainy afternoons, and can fit any stroller you bring, buy, or rent while you are there. Good idea! I never even thought of using a shower curtain! This also works with a wheelchair. Just cut a hole in the top for their head to stick through. We do this with our son and it keeps his legs and feet dry. His head stays dry from the poncho. We’re going to WDWfrom Oct 26-Nov 6 and I have already printed this list and started to organizing. Super helpful!!! I just printed the packing list off, again for the second time. Last year I used it, and it was a the best thing I could have done to prepare us for our trip. I don’t know what I did with it, so I printed a new one. Thank you Shannon for all your great tips and knowledge on things for Disney. For those staying at the Animal Kingdom Lodge, a small pair of binoculars is really great if you have a savanna view room! When I try to print the post, it just prints the rest of the blog post without the list. When I download the PDF, it’s just gibberish. When I try the Office file, it only shows as much as will fit on one page… need help. You dont need autograph paper. I have a blow up baby tub that I bring with me when I travel so my little guy doesn’t have to sit in hotel tubs. It folds flat and fits easily in my suitcase. I would also add Benadryl/allergy meds for yourself and the kids. Allergic reactions are a bummer! Allergy medicine is listed under the medicine section. Especially important for kids as WDW might only have tablets available and not liquid. Maybe I missed it – but I would definitely add a light jacket – no matter what time of year you go! Plastic hangers or clips so you can hang wet clothes/bathing suits to dry from the shower rod and a collapsible mesh laundry basket that will fold flat on the bottom of your suitcase for dirty clothes helps keep the hotel room neat. Another good tip for a park touring bag; if you separate your items into ziploc bags it will make it faster during bag checks (you can dump everything out and then repack it really quickly and it will also protect your belongings on wet rides or in a sudden downpour). I carry extra hangers, cause there are never enough. (the plastic ones when you buy clothes from Wmart, that pants/shorts are sold on) for your Pants,Shorts,Skirts. And I carry an empty spray bottle, add warm water, spray the wrinkles from the clothes, and hang them on the shower rod, the night before. I despise ironing. And everyone feels better if they look nice. I’ve perfected my list over a span of 20 years now, always saving it on my computer. I even have a Disney section (we travel other places too). I’ll have to compare yours to mine to see if I missed anything. These come in handy to put on flight tags as well as share your address with new friends you meet and want to stay in touch with. Saves lots of writing. This list is absolutely fantastic! There were so many things that I didn’t think of. Thank you very much very helpful. Great ideas! I would also suggest for both boys and girls you bring compression shorts! These are thin spandex shorts that can be worn under shorts or skirts! The help prevent any chaffing that may occur from all that walking! My boys wear them under their bathing suits all the time. I would cut out the ” netting” briefs in the bathing suit . Also a small tube if aquafor by Vaseline will sooth chaffing should there be any!! This is great!!! I been stressing because we just decided about 3 days ago to take our first trip to Disney world with our 5 year old son, 4 year old niece, and 2 year old daughter the first week of June. So many good ideas and information on what to take. I APPRECIATE THIS SOOOO MUCH!! Definitely don’t forget fat pens for autographs…just ordered new Super Sharpie Twin Tip pens for our upcoming trip from Amazon…they have chisel and fine tips (great for autographs). Used them for our last trip and every character went out of their way to express their thanks to the kids (or me/hubby) for bringing them. Even Darth Vader gave us a big thumbs up!!! I always bring a bottle of Febreez. It gets plenty of use when sharing one bathroom! Amazing list! I would add ALOE gel (for sunburn). Cause as much as you try to avoid getting the dreaded sunburn in disney (especially if your not used to the Florida sun) it’s a life saver. I love the list. I take a lot of stuff because you never know what you might need. I also like to put a few cheap plastic clothes hangers in. I can always leave them behind. The rooms just seem to not have enough hanger for all my clothes. I love the towel idea to take to the parks. Do you think I could leave it in one spot by itself for an hour or so without someone moving it? I’m travel alone this trip and one of my goals is to watch a parade from the curb. Thanks for the tips. A towel will not hold a spot at Disney….especially on Main Street where is seems to be the most crowded viewing. Get there early, and be prepared to defend your spot. I will let any child edge up beside or in front of me to see Mickey or Cinderella but not their parents ~ most of whom are taller than my 5’2″ height. The parades are awesome ~ most folks aren’t. One important item(s) that I would add to this list, especially for families with school-aged children would be…. 2. #2 pencils with a sharpener. Automatic pencils have broken and run out of lead on a previous trip. Thank you for reminding me! Great addition to the list. Baby outlet covers have made hotel stays a little less stressful for me with a very mobile little crawler on my hands. And they don’t take up a lot of space in your luggage. I love this website! I have been to Disney with my kids about three times – once per year since 2011. Each time, I learn something that I should have thought to bring! Our trips have been very short, since my kids are young (my in laws live near by, so we’d only stay a day or two, max). This time, we’ll be there for 5 days, our longest trip to Disney yet. Since our kids will be 5 and 7 at the time we plan to go, we figure they can handle a longer trip. I never thought to bring a towel – this is a WONDERFUL idea for many reasons. I will definitely use this list this year! If you have children that enjoy dressing up, you might want to pack pirate gear (probably not swords, though; just bandanas and patches will do) OR princess dresses. My daughter likes to wear her princess gowns over her clothes (until she gets too hot and then we stuff them in the back pack). My son wants to be a Jedi this year, so we’ll bring his cloak. I’m not sure if they’ll let him carry his lightsaber, however. If you don’t want to spend the money on the Pirate’s League or Bibbidi Bobbidi Boutique, you can bring make up (black eyeliner and pencil for the boys and glitter and lipgloss for the girls) and costumes from home. Thank you! It is a great idea to bring a princess dress/make up and pirate costume for my 5 and 8 year old. We are going in October 2014 and can’t find the time or money for “BB Boutique” and the “Pirate” dress up thing. I will be sure to remember this tip! My little boy suffered from extreme constipation at the time & needed extra underwear, a 3 pk. on the other side of the park was all you could purchase for $18 plus tax. Plus you may need wipes in a ziploc bag. Thank you so much! I always look for one, but have trouble finding one that I really like- this one is excellent! 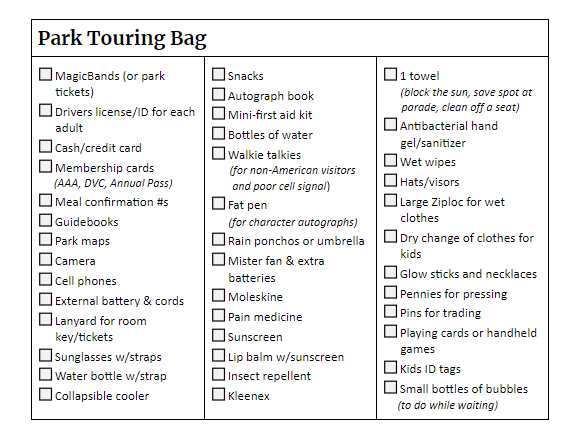 Love these lists but now I’m dying to know what kind of a bag you bring into the park. Do you have some kind of tips for organizing all the stuff you’ll need day of? – “capture the memories” without carrying the over stuff back pack- I’m sure I won’t use 1/2 of! -any tips for the essentials AT THE PARKS? For me a cross body body bag is perfect! It’s hands free, stays close to your body and its easy to maneuver on and off rides. I use plastic baggies to organize the inside. For the kids I take one half filled, diaper-ish type bag for their belongings. I either shove it in the storage part of the stroller or attach with a “mommy hook.” That bag always comes bag filled! I always include quart and gallon ziploc bags, for phone & camera on wet rides like Splash Mtn and even Kali River Rapids. (At Kali, you can store larger items inside their free locker, but for items you want to keep with you, they will get wet in your pocket, and the center storage container is usually already wet inside!). Also, packets of wipes. May it be hand sanitizing wipes, flushable wipes, Chlorox wipes for tables & even for toilet, you can always feel cleaner with wipes! We’re going to Disney World the first week in December and staying in a Nemo Suite at the AoA. I found small bath scrubbies with fish on them at the dollar store. One even had Nemo on it. I also found small bottles of hand soap with Nemo on them. They can be left behind at the end of the trip but will come in handy. I found small LED lanterns in Target that I am sure will come in handy. Referred to this list about 10 times before our recent Disney trip. I would suggest adding scissors as we used them 3 or 4 times mostly for snipping off tags. Yes thank you for the reminder. I hate when I forget to bring scissors! I usually just bring a pair of kids ones. Mostly end up using them for cutting tags off things! I use nail clippers to snip tags off new purchases. I bring them anyway so I try to use them for multiple things. Great list! I like the power strip so everyone can plug in their iPhones, iPads, iPods, DS… well you get the picture. I also love that I can use my phone for camera, white noise, radio, book, movies and games for entertaining, texting (who needs a walkie talkie? ), video, and every great Disney app out there! ect and it sits in my pocket! Speaking of park entertainment my kids are enamored with finding Hidden Mickeys. Keeps them busy alllll day long. I downloaded the app ($9 but cheaper then the book and way better then carrying and flipping thru a book too). Hello there fellow Disney traveler! We used this list last year when we went to WDW with our 3 year old son. I tweaked it here and there, but it was a time saver for sure. I was able to finally relax about planning and packing everything and enjoy our vacation so THANK YOU for compiling this list. We’re using it again this year when we go in September. Hi. This is a fab list and will be using it thanks. I would add blister plasters and sudocrem (or US equivalent – its like a nappy rash cream) as fab for sunburn, rashes and chaffing. I have a very similar list as an Excel spreadsheet and everyone laughs — until they need something, that is! I would add: duct tape (take out the cardboard roll and squash flat) and glasses repair kit with mini-screwdriver for fixing sunglasses and opening battery compartments. As for the baby stroller, I prefer bringing my own over renting one and I highly suggest having a stroller for non-babies too. Even a 5 or 6 year old will be exhausted by the end of the day. Good for getting to and from buses, especially. I dread the day my girl is too big/old for hers. Shannon, this is wonderful. I always make a list about 2 weeks before we leave. This is a time saver for me. I absolutely love your web site. There was something you missed……scissors!!! I always travel with scissors. Seems like I’m always cutting the tags off of something or needing to open something. Also, I always have a pen and notepad with me (for notes of course) and yes, I’m a nerd! I LOVE the bubbles idea while you wait in line. We went to King’s Island with my 2 & 4 year old for just a few hours and my 2 year old had a melt down waiting in lines. But she LOVES bubbles, so we are trying this one! Thanks! We are taking our first WDW vacation in May. I have referred to this list so many times!! Thanks bunches!! I thought of one more thing to add to your amazing and extensive list: Sheets! No matter what level of hotel you stay at, they seem to use the same white scratchy flat sheets that don’t stay on the bed. On top of that annoyance, I have very sensitive skin and get a rash from the harsh laundry detergent that WDW uses. So, we pack a set of sheets from our home bed and bring our own pillows. It makes sleeping so much more enjoyable! Also saw that you added a sound machine to your list. I have a sound machine app downloaded to my ipad that I play all night. That is some list! Thanks!